This award replaced the former International Activity Award and the International Youth Exchange Award, which are no longer available. 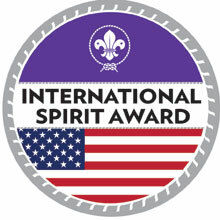 The International Spirit Award is a temporary emblem that is awarded to registered Scouts and Scouters who have completed the necessary requirements, have gained a greater knowledge of international Scouting, and have developed a greater appreciation and awareness of different cultures and countries. This award serves as a replacement for, and therefore eliminates, the International Activity emblem and the Youth Exchange emblem. The International Spirit Award emblem is $4 each and can be purchased from the International Department. Make checks payable to Boy Scouts of America. Please download, print, and fill out the application with the date that each requirement was completed. All requirements must be met within 5 years from the start to completion of the award. Please mail the completed and signed application with a $4.00 check made out to “BSA” to the International Department, S340, PO Box 152079, Irving, TX 75015. Complete two of the 10 Experience Requirements. Complete three of the 10 Experience Requirements. Learn about the World Organization of the Scout Movement (www.scout.org). Explain to your unit or at a district roundtable what this organization is and at least three ways that the WOSM website can be used to promote participation in international Scouting. Read the most current International Department newsletter (www.scouting.org/ international/newsletter) and promote at least two items from the newsletter within your unit or at a district roundtable. Complete four of the 10 Experience Requirements. or family over the meal. Contact your local council’s international representative and assist them with at least two items they need help with promoting.